After losing a diamond already in my engagement band, I realized that I need to start taking better care of my rings so that they will last for years to come! I stopped wearing my rings to bed and stopped wearing them in the shower (I know, we will see how long this lasts). At any rate, I needed a ring dish for these beauties, so I set off to Target for some supplies and crafted away! 4. Metallic Market- I bought this pen at the $1 section in Target! 1. Tape the edges of the dish and leave room to color a trim onto the top of the ring dish. 2. 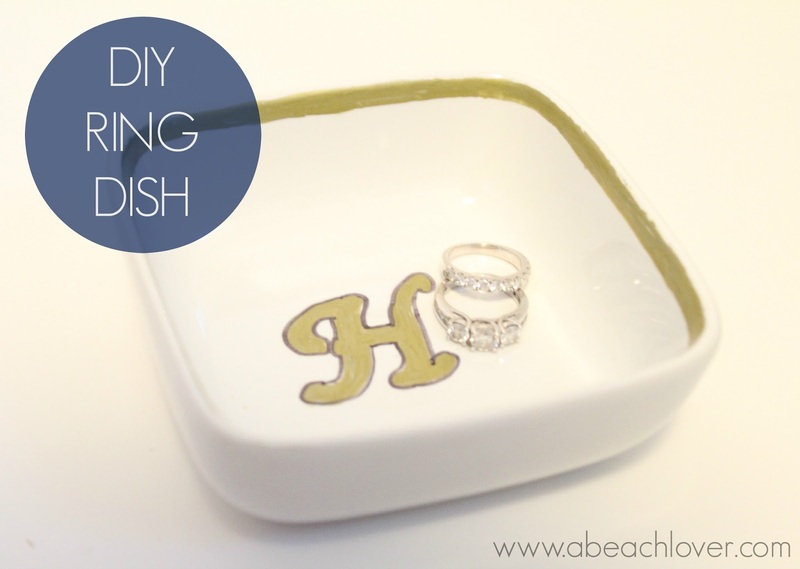 Place a sticker in the middle of the ring dish (I chose 'H' for our last initial). You could either trace around the sticker, remove it and color it in or leave the sticker in the middle! 3. Once you tape the trim of the ring dish you can begin coloring in with your metallic marker. 4. Voila! You have a cute lil' ring dish to hold your rings! This project was super easy and now I have somewhere safe and cute to keep my rings while I snooze away! Do you sleep and shower with your rings on!? This DIY Ring Dish looks so pretty. Thanks for sharing the tutorial my friend. I would make this dish for my sister’s engagement party. She has planned to have fully DIY party at some domestic indoor event space San Francisco. So I am gathering such ideas.